Combine the turkey or chicken with the chopped garlic, rosemary, red pepper flakes, paprika, fennel seed, poultry seasoning, salt and pepper. Chill for several hours or overnight to allow the flavors to combine. To roast the garlic, pre-heat the oven to 400°F. Cut the bulb of garlic across the top end to expose all of the cloves, then dress with a drizzle of EVOO, salt and pepper. Wrap the bulb in foil and roast until tender and caramel in color, 40 minutes. Meanwhile, melt the butter in a skillet over medium heat. Add the onions and bay leaf and season with salt and pepper. Stir occasionally for 30 minutes, until the onions are caramel in color and very soft and sweet. Deglaze the pan with the white wine and discard the bay leaf. In a food processor, squeeze out the roasted garlic cloves from the skins and add the onions and enough stock to smoothly puree into a sauce. Add the puree to a saucepot and combine with the cream. Reduce to thicken while the pasta cooks. Bring a large pot of water to a boil; salt the water and cook the rigatoni to al dente. While the water comes to a boil, heat a large skillet over medium-high heat with the 2 remaining tablespoons EVOO, a couple of turns of the pan. Add the homemade turkey sausage, crumbling it as it cooks. 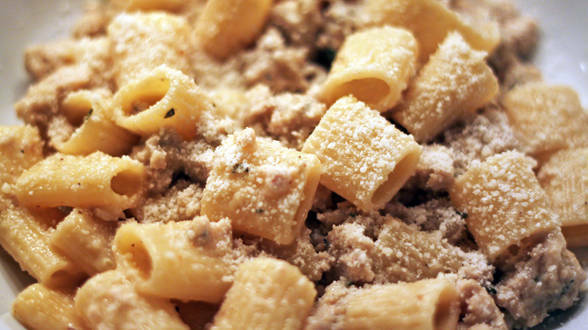 Combine the pasta with the sausage and creamy sauce and top with Parmigiano Reggiano cheese. In Recipes-list.com we have selected the most viewed recipes from category - uncategorized . Enjoy the best recipes specially selected for you! Turkey or Chicken Sausage with Rigatoni in Roasted Garlic and Caramelized Onion Sauce is the right choice that will satisfy all your claims.